Justice League director Zack Snyder just released an all-new look at Wonder Woman in the film, in honor of the character's 75th anniversary. She's being honored at the United Nations today, and the image is part of that celebration, showing Gal Gadot looking concerned and ready for action. Click in the gallery below for the full-sized image. Gal Gadot debuted as Wonder Woman in Batman v Superman: Dawn of Justice, following that up with back-to-back films, Wonder Woman, hitting theaters in June 2017, and Justice League, in November 2017. Her solo film will tell the origin story of how Princess Diana of Themiscyra became the hero known as Wonder Woman during World War I. Justice League follows the events of BvS, as Batman and Wonder Woman look to recruit new superheroes to their cause following the destruction that Doomsday wrought. Patty Jenkins directs Wonder Woman, while Zack Snyder returns to the DC Films universe for Justice League. In this her 75th anniversary, the United Nations held a ceremony today to recognize Wonder Woman as the UN Honorary Ambassador for the Empowerment of Women and Girls. Both Gal Gadot and 1970s Wonder Woman TV icon Lynda Carter attended the ceremony, along with Jenkins and DC Entertainment president Diane Nelson. 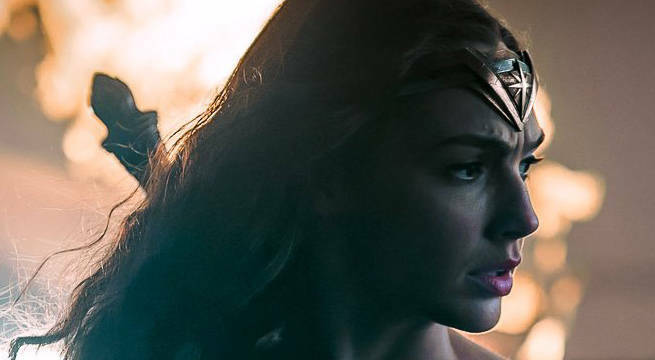 This new shadowy look at the film version further teases the character's prominent role in Justice League, showing her strength while a look of concern on her face expresses the character's great empathy. Putting her in shadow is the only thing that's slightly off for the character, who tends to be more of a shining light in the dark hours, and could be foreshadowing some truly dire circumstances for her in the film. Wonder Woman will support the UN in Sustainable Development Goals, delivering the message via a PSA with Gal Gadot, messaging in DC Super Hero Girls and other platforms, and even a special comic book that will be released in Arabic, Chinese, English, Russian, and Spanish, the six official languages of the U.N.